The first Jewish person to live in the village of Detroit was, apparently, Mr. Richmond, a merchant or trader from Montreal who arrived about 1780. The Jewish community grew slowly. In the mid-1830s, there was a small influx of German immigrants to Detroit. Most of them were Catholics, so St.Mary's Church was established to serve their needs. Later there were German Jewish immigrants coming to Detroit. Cincinnati was a major point of arrival for Germans in the Midwest. A number of the Jewish immigrants were merchants who travel around. Presumably some came and settled in Detroit. In 1850, the first religious meeting of Jews took place in the home of Isaac and Sarah Cozens, which was located near the intersection of East Congress and St. Antoine. This was near the Harmonie Park neighborhoods, which was the city’s largest concentration of Germans. These German Jews fomally organized the Beth-El Society on September 22, 1850. The first Detroit rabbi was Samuel Morris whose congregation consisted of a dozen Orthodox families. This was a time of considerable change for Jews in the Western World as the Reform movement spread. In 1856, the Beth-El group adopted the Reform movement but not without conflict. Those who wished to remain as Orthodx Jews formed Congregation Sharrey Zedek which survives to this day with a beautiful synagogue in Southfield. Many religious congregations in Detroit started by holding meetings in a private home or purchsed a small wooden church that had been abandoned with its congregation was able to built a more substantial strucutre. In 1861, Beth El was able to purchased the former French Methodist Church on Rivard for their use. Six years later, they gave up on that small meeting place and purchased the former Tabernacle Baptist Church near the corner of present-day Washington Boulevard and Clifford. In 1898, Rabbi Leo Franklin began leading this congregation, a job that he held until 1941. He became the city’s leading spokesperson for Jewish concerns and was well known nationally. Although Henry Ford is now seen as a strong anti-Semite, Ford counted Franklin among his friends and provided him with a new car every year. Franklin had entrepreneurial talents and quickly sought to build a massive temple in Detroit’s Piety Row; that is, in the stretch of Woodward that now extends from Central Methodist at Grand Circus Park at least as far as Blessed Sacrament Cathedral. Having a temple in this prestigious location would give great visibility to the success of the German Jewish community in Detroit. I believe that George Mason was originally commissioned to design the temple. Mason is the architect who recognized the exceptional skills of Albert Kahn and gave him his start in the field. Kahn was a member of the Beth-El Congregation and helped design the building that you see. When he designed this synagogue, I believe that Albert Kahn was employed by George Mason and Zacharias Rice so they may have had a hand in the design. This is a Beaux-Arts structure much influenced by Roman and Greek temples. Indeed, it is quite likely that Albert Kahn had the Parthenon in mind when he designed this building for his congregation. Attached to the prominent doomed main area of the temple are gabled wings on the north and south, and by a pedimented extension on the front that once extended into a porch. Most of the exterior is smooth white limkestone. Almost all of the impressive religious structures facing Woodward from St. John’s Protestant Episcopal to the Cultural Center lost much of their attractiveness when Woodward was widened. Although they faced barriers in the housing market since many developer and real estate brokers would refuse to sell to Jews, Detroit increasingly prosperous Jewish popualtion moved north along Woodward. The Boston-Edison neighborhood and surrounding areas were “open” to Jewish residents. This Congregation turned to Albert Kahn once again and he designed the classical style synagogue that now stands at 8801 Woodward at the corner of Gladstone. It opened in 1924. That same year, Jessie Bonstelle, manager of the Gerick Theater in downtown Detroit, purchased Temple Beth El and then called in the nation’s most distinguished theater architect, C. Howard Crane. He redesigned the building for use as a legitimate theater. This primarily involved major changes to the interior of the building.It was used for that purpose for about nine years, but Detroit had a surfeit of such theaters and, in 1932, the Bonstelle Theater became a moving picture venue.However, more changes were in store for the building when Woodward was widened to to six lanes in 1936. At that time much of the porch along Woodward with its massive pillars was removed. 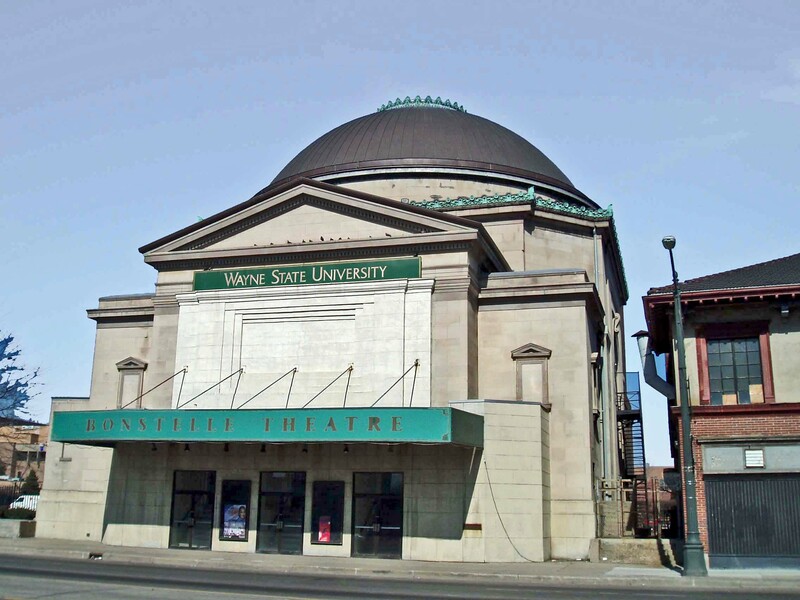 In 1951, Wayne State began renting the location for performances by their theatrical students. Five years later they purchased the building. The temple at Gladstone and Woodward served the needs of the Beth El congregation until 1973 when, reflecting the geographic migration of Detroit’s Jewish population from the city to the northwest suburbs in Oakland County. a new synagogue was built at the intersection of 14 Mile Road and Telegraph in Bloomfield Hills. For more information and for a picture of how this building looked when designed by Albert Kahn, please see the book cited below.